I read Shadow of Night by Deborah Harkness over two years ago. As I recall I stayed up all night reading and finished the book in 27 hours, reading through the middle of the night until the sun rose. To refresh my memory, I listen to Shadow of Night on tape as I did A Discovery of Witches. Once again, Jennifer Ikeda narrator and she did an impeccable job. Shadow of Night begins moments after A Discovery of Witches. Diane and Matthew return to the past to seek safety and a teacher of Diane. But 1590 Elizabethan England is no safe haven for a witch. Diana is enthralled with the idea of ‘living’ the historical events and people she has spent her life studying. However, even with all her knowledge of the times and people, she is woefully unprepared for the smaller details of daily life. Yet, Matthew easily reclaims his former life as Matthew Roydon, a spy for Queen Elizabeth and a member of the radical group known as the School of Night. I enjoyed the twists and turns in the plot, and the development of continuing characters as well as newly introduced ones. Espionage, politics, love triangles, jealous, this books has it all. Not only did the plot line get more compelling, but also Harkness was able to weave in the difficulties of the newly wed. I savored every minute of this novel. Through Diane and Matthew we meet Christopher Marlowe, Walter Raleigh, Henry Percy, the Earl of Northumberland and a host of other historical characters. 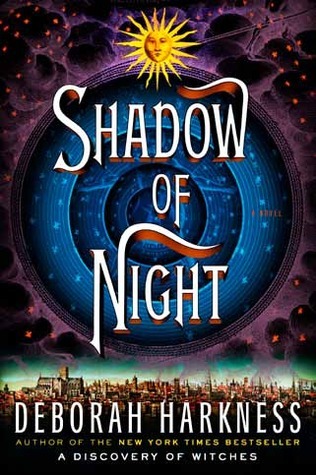 Shadow of Night novel is full of historical facts and characters intermingled with Harkness’ addition of fiction, and the historian in me loved every minute of it. I’ve read other reviews that found this all boring and dull. I, however, found Harkness’s characters based on historical figures delicious fun. Ferdinand II, Holy Roman Emperor, was laugh out loud funny and possibly those who know do not know anything about him will not understand. (Shrug Shoulders) Dr. Deborah Harkness is a History Professor after all and I thought this book was amusing and entertaining. This entry was posted in Adult Fiction, Historical Fantasy, Magic, Vampires, Witches and tagged Adult Fiction, Deborah Harkness, Historical fantasy, Jennifer Ikeda, Shadow of Night. Bookmark the permalink.